We use only equipment that is well recognized in the professional community for it's reliability, sonic quality, and capability to deliver the most exciting impact to a large audience. In part, our reputation depends on equipment that always works, and performs well. We are constantly adding and upgrading our equipment to ensure that your event will sound the best that it possibly can. Shure, Numark, Behringer, Kustom, Eliminator, Gemini, Vocopro, Helicon, Electrovoice, Chauvet, and American DJ are among the brands we use. Though our equipment is maintained in top condition, as everyone knows, even the best equipment can sometimes fail; however, in the last ten years, we have only had one equipment failure - and we didn’t miss a beat, because we always bring “back up” equipment. The show must go on and with us, it will, and without a hitch! Generally, at our karaoke gigs we connect to a large house video monitor for everyone to see, in addition to using our own screen to display lyrics for the performers. 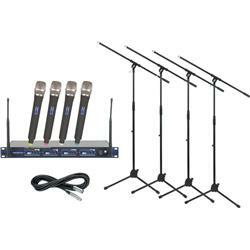 Our crystal clear Vocopro wireless microphone system boasts four microphones so everyone can join in on the fun and each song is individually “mixed” to bring out the best in every singer. It is our job to make you shimmer! But, even the best equipment will not make your event a success without a skilled and experienced DJ/KJ who knows how to use it to get the best possible sound for every singer and every venue. See our great Music Library!